The water powered bus is an environmentally-friendly mode of public transport, which is overwhelmingly favoured by environmentally-concerned commuters around the world. Communist commuters, on the other hand, just don't care. Neither does George W. Bush. The water powered bus is the standard mode of public transport in nearly all major cities, and is the only form of transportation that runs entirely on water. The creation of the water powered bus was not simple, and did not follow the simple process that most other inventions go by to become invented. The idea of powering a bus using nothing but water has been around for centuries. 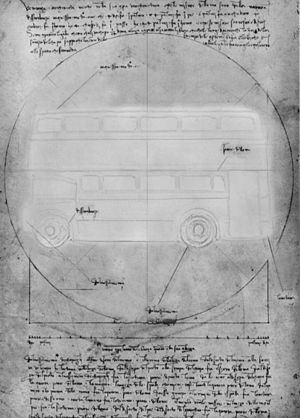 The most well known example of what is thought to be a primitive water powered bus was drawn by Leonardo da Vinci, most likely around the age of five. A full-colour reproduction of this original sketch is shown on the right. It is not the earliest known example though, as several water powered buses have been found depicted in cave paintings, dating to thousands of years ago. "I love my job - I've wanted to build buses since I was but a lad - but now I feel somehow restrained; destined for bigger things." That all changed, when Henry decided to visit his local art gallery, where da Vinci's famed sketch of the water powered bus was on display. Upon seeing the picture, he suddenly realised that this was his calling, and could use his bus-building expertise to build the water powered bus and revolutionise the way the world thought about buses. He started working on the designs that very night. The first test of the water powered bus was a total failure. "I pondered the problem for several minutes, and suddenly the answer came to me in a flash of inspiration." Once that problem had been solved, the rest of the task was easy for Henry, who had dozens of years experience in building buses. He spent a week locked in his shed, assembling parts for the bus. 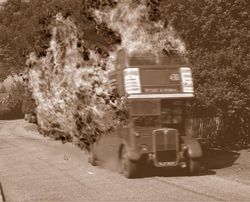 Bus considered the early tests of the first water powered bus a total success - the bus ran for ten whole seconds before exploding. With later refinements the perfect water bus was presented to the public, with the low self-destruction rate of approximately 2.003 %. 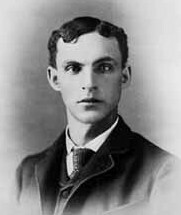 Though Henry believed he had created the perfect bus, he found it difficult to sell the idea to any large-scale bus manufacturing factories. Potential buyers didn't think the idea would catch on, citing the ease at which people could already obtain petrol to run their buses. "Water just isn't all around," commented one of the larger bus manufacturers. "On the other hand, look at the rivers of petrol!" The change came when Henry was commissioned by the Queen to make a bus for her crowning ceremony, because she wanted to ride to the ceremony on something new to symbolise the new era she would be bringing in. Henry gladly obliged, creating a magnificently decorated water powered bus, resplendent with gold plated thing-a-ma-bobs, jewel encrusted doo-dahs, and ornate whatcha-ma-call-its. "... it allowed me to live out my dream of being the world's greatest bus maker." The water powered bus is still as popular today as it was in those early days. When these effects combine, the water undergoes spontaneous nuclear fission. The power from the nuclear fission drives a powerful jet engine that propels the bus to incredible velocities. The only residual emissions from the vehicle are heat, air, water vapour, and deadly gamma radiation. Though this revolutionary way of powering buses may seem ideal, it is actually rather inefficient. So much so, in fact, that water powered buses can generally accelerate for no more than one and a half minutes before they run out of water. The official top speed of water powered buses is unknown because of this. However, the highest speed ever recorded by a water powered bus before running out was 852.4 miles per hour. The inefficiency is not a problem under normal use, however, as all water powered buses are fitted with rain scoops so they can refuel as they drive. Theoretically, if a water powered were to travel at under 10mph while raining, it could run indefinitely. This makes it perfect for use in Britain, as it is raining all the time there. Modern versions of the water powered bus also come with modifications that allow them to grind rice into rice-flavoured flour using a large array of outboard windmills as standard. This secondary process helps to offset running costs, while also feeding the world's hungry. Water powered buses are common in today's society, and have replaced old petrol-powered buses in every city with water since 1958. Several alternative methods of public transport have been invented since its inception, most notably the Chinese rickshaw man and the cannon, and the water powered bus faces fierce competition from these new forms of transport. Mostly because even walking is usually quicker than getting a water powered bus, due to the speed limitation inherent in the design. It is yet to be seen whether these new inventions will be adopted as the main mode of transport ahead of water powered buses, but most believe that that is very unlikely. This man has customised his water powered bus, and now he gets all the ladiezz. There is also a rather large water powered bus "mod" community, where people will buy old buses and "trick them out", to show off to their "homies". These modified water powered buses can often be seen "cruisin'" up and down high streets late at night. 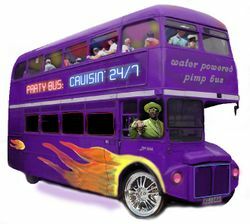 The practice has seen a lot of publicity recently, with hit shows such as "Pimp My Bus", hosted by famous rapper "Eggs-Biscuit", where unsuspecting members of the public have their buses "pimped". Video games such as "Need for Speed: Bus-ted!" have also popularised the activity. changeable pods á la Thunderbird 2.
performing tricks such as wheelies, spins and rolls (without exploding). While most modifications are harmless and relatively safe to carry out, a minority of the modding community use dangerous and illegal methods in customising their buses, such as adding alcohol to their water. 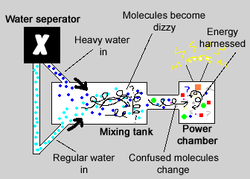 This is especially dangerous, as this causes the water molecules to become not only dizzy, but drunk as well, making the fission reaction much more violent and unstable. While this may give a performance boost, it makes the chance of exploding one hundred times more likely. Other illegal modifications include installing strip clubs in the bus, as this makes it almost impossible for the driver to concentrate while driving. It is difficult to say what the future holds for the water powered bus. Scientists are "reportedly" hard at work, attempting to create a water powered car, but have had no luck yet. Work continues on making water powered buses more efficient to be unable to break the 10mph constant speed barrier, and more reliable so they only explode less than 2% of the time. There are three movies currently in production that feature water powered buses in some way - a documentary detailing the life of Henry Bus, a remake of Chitty Chitty Bang Bang with the car replaced with a water powered bus, and the latest instalment in the James Bond saga, which will include Bond driving a water powered bus to save the day. The Winner of the London bus competition, to find a new replacement for the classic route masters was revealed by the Mayor of London Boris Johnson. The Bus run on Children's Tear-drops, the saltiness is particularly good at driving buses full of chavs. The Bus also features a giant oyster card that scans Humans before they board for weapons and annoying mobile phone speakers. This page was last edited on 27 October 2014, at 19:31.